The art of perfect pancake making has eluded me for a long time. I don’t particularly like pancakes (unless they’re loaded with chocolate chips and drizzled with berry syrup), so I’ve never tried that hard to find a good recipe. For as long as I’ve been married I’ve always just used the standard recipe on the back of the Bisquick box. Greg never complained – I think he’d eat any pancake anywhere. He loves them. Me, not so much. Anyway, one day I felt inspired to find a better recipe when I wanted to make a special breakfast and didn’t have any Bisquick on hand. 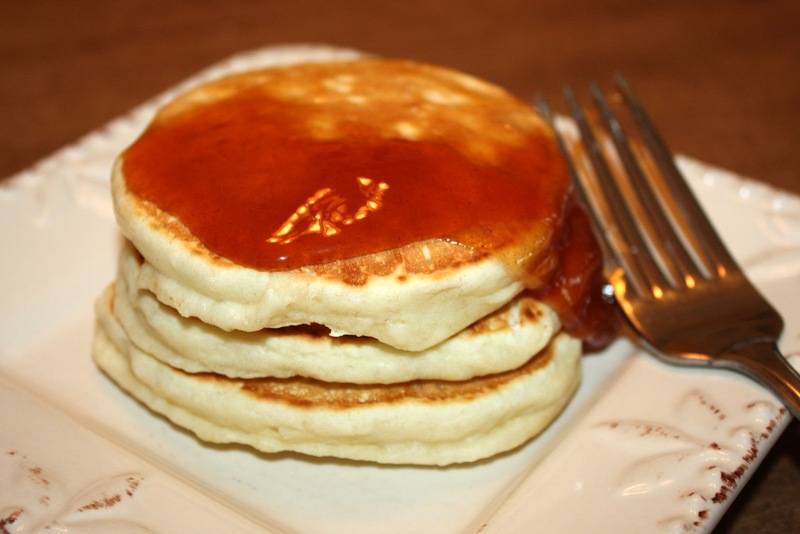 I came across this recipe for Old Fashioned Pancakes and I was totally amazed at how much more I liked them. Granted, I’d still prefer some chocolate thrown in, but these are good. And easy! I love easy breakfasts that everyone will eat. The first step is to mix your dry ingredients: 1 1/2 cups flour, 1 tablespoon of sugar, 1 teaspoon of coarse salt, and 2 3/4 teaspoons of baking powder. Then form a well in the middle and pour in one egg, lightly beaten, 1 1/4 cups of milk, and 2 tablespoons of melted butter. Whisk together and then place bowl in the fridge for ten minutes to rest. This step is important! It makes the batter a lot fluffier once the baking powder is fully incorporated. While your batter is resting, fire up a pan to medium heat. Then rub some butter on the surface. Or oil, or baking spray, if you prefer. Finally, drop a few tablespoons or up to 1/4 cup of batter on to the pan. 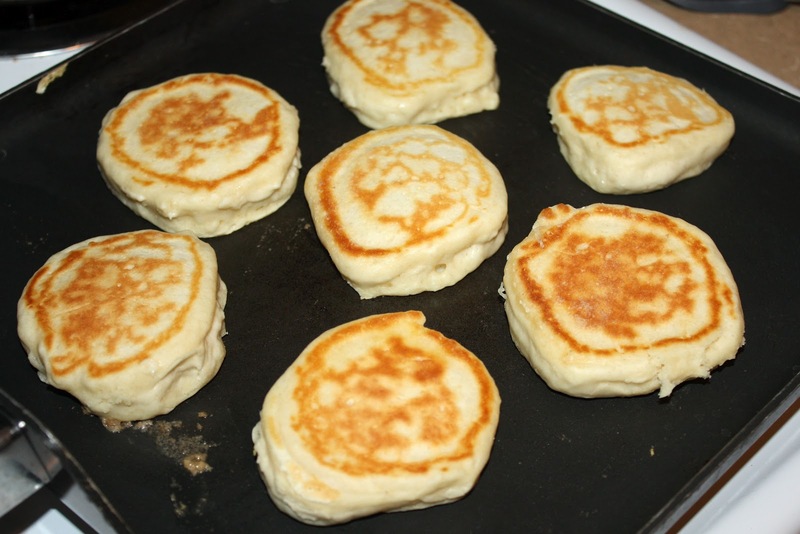 This time around I tried to make mini pancakes by using a small cookie scoop. I probably wouldn’t do that again because the pancakes were incredibly thick. The great thing about this batter is that it doesn’t spread, so you won’t get super thin and gross pancakes. But you don’t want to lay it on too thick either or it won’t cook through. And that’s it! If you’re not going to serve these immediately (or you want to actually have everyone eat at the same time!) you can keep them warm on a baking sheet in a 200 degree oven. Serve with butter and your favorite topping! Today we tried this cinnamon cream syrup I gave Greg for Easter. I thought it would be delicious and cinnamon rolly, but it was gelatinous and kind of disgusting. 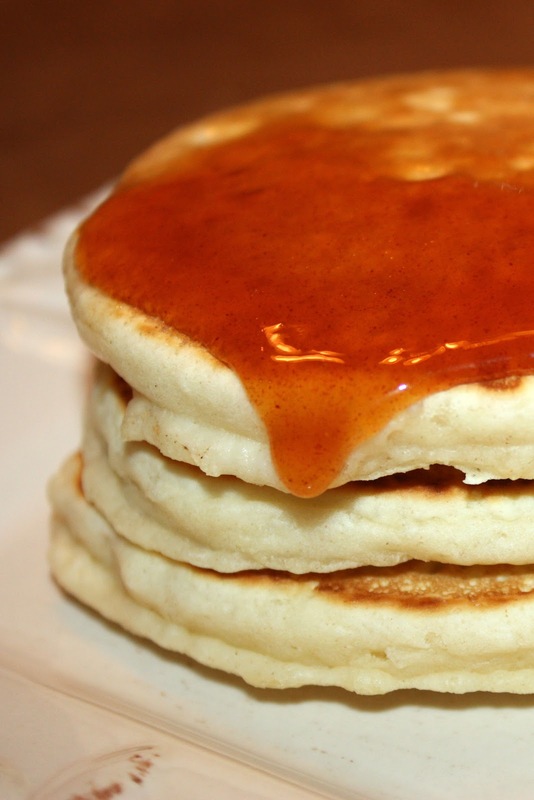 Anyway, if you’re looking for a new and tasty pancake recipe, this one is worth a shot! It’s pretty near perfect. 1. Mix dry ingredients. Form well, add wet ingredients. Whisk together. 2. Let rest for ten minutes in the refrigerator. 3. Heat griddle or frying pan to medium heat. Rub butter on the pan. 4. Scoop batter on pan and let each side cook until golden brown. Keep warm in 200 degree oven until serving. Previous Previous post: Dang Mommy All Day!